All Dressed up Challenge blog: Let it snow, let it snow, let it snow...Dressy Girl Christine inspiration. Let it snow, let it snow, let it snow...Dressy Girl Christine inspiration. Christine here today - and I decided that as we hadn't had any snow yet in real life (phew! 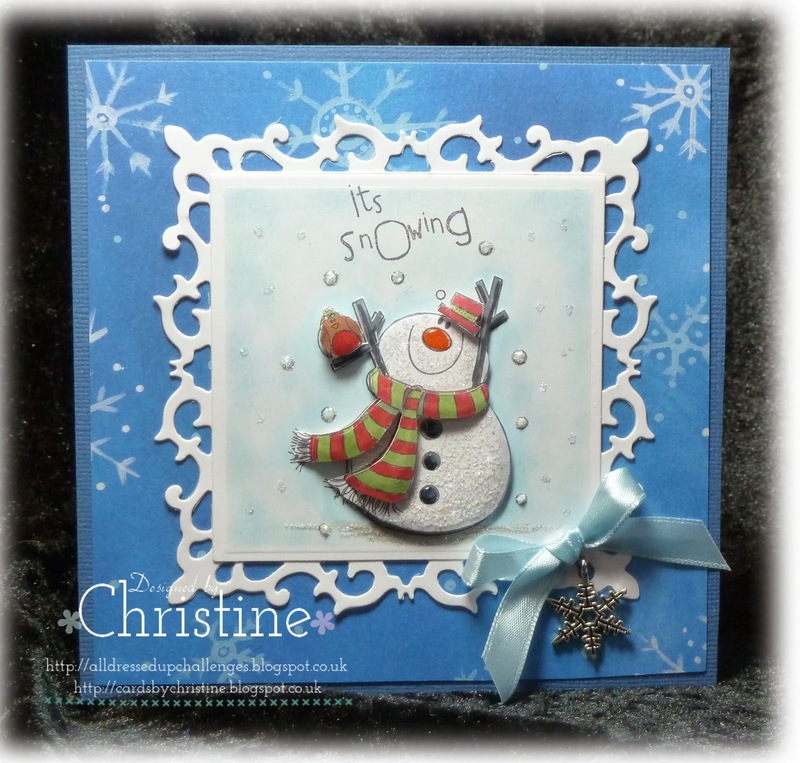 ), I needed to do a card showing some of the sparkly white stuff, so my creation showcases the fabulous 'It's Snowing' digi image ..... and as this little snowman is soooo darn easy to colour ... I decided to decoupage him too! All I did was print him three times... then diecut the first image with a square. Then I fussy cut his body to layer... and lastly fussy cut another scarf, hat, robin and nose.. but I lost the nose before I got it onto the card! Lesson learnt there for me... to have a tidy desk when I decoupage! So I resorted to Glossy Accents for his nose, and for his coal buttons too. After I'd coloured the image (using Cool Gray Copic 1 and 3 on the white snow to give it some shade), I used sticky foam pads to layer up to give him lots of depth... then added a Spellbinders Square Fleur De Lys behind the image shape. I sponged a pale blue around the image while the square nestie was still in place to give me that white border. And of course, no snowman would be complete without glitter to show the sparkles.... so I used my glue pen and sprinkled loads of it!! The paper was one that I've had in for years... and the snowflake charm too... so all I needed to do was add the bow and the card was done. Hope I've given you a different way to use a digi image today... to actually make it 'pop off the page'. Now why don't you get yourself over to All Dressed Up and bag a snowman today to give it a go.. And if you need to know more about what I did... pop over to my blog - http://cardsbychristine.blogspot.co.uk/ - and give me a shout.... I'll be there! There are also some YouTube tutorials there so you can see how I do the shading. Thanks for visiting All Dressed Up today..
Beautiful, I just coloured this image today.....never even thought about decoupage. looks fab! Some Spring Fairy Magic from Dressy Girl Lis. Rose inspiration from Dressy Girl Lizzy. Snowy inspiration from Dressy Girl Viv. Some Male inspiration from Dressy Girl Peggy. Cute as a button cake !